Every child should be born equal. But in reality, some are living a good life while others have no home to go to, and as a result, suffer constantly from violent abuse and sexual exploitation. Christina Noble Children’s Foundation (CNCF) as a charity organisation is determined to make Hong Kong public aware of this inequality, and seek their support in helping street children. Traditional paper cuts, normally symmetrical, were designed to show on one side a child in an abusive environment, with the other side showing a child in a loving family. The headlines provide a play on symmetry. The three Chinese characters on both sides are exactly the same but in reverse order, so when you turn the words around, the opposite meaning will be conveyed. 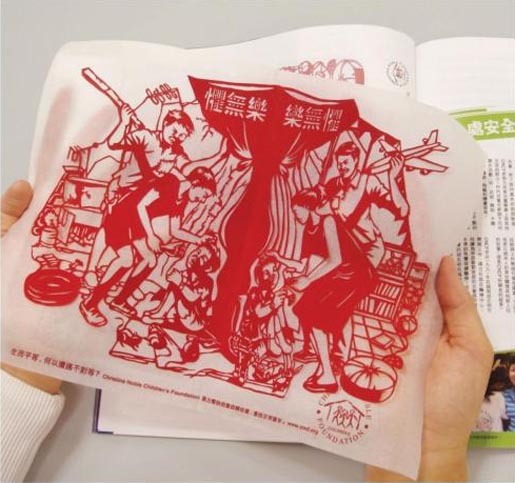 The paper cut was inserted into magazines, accompanied by two pages of advertorial with stories about the CNCF helping street children through love, care, accommodation and education. The campaign won a Silver Design Lion at Cannes International Advertising Festival. The Paper Cut campaign was developed at Leo Burnett Hong Kong by executive creative director Connie Lo, group creative director Miranda Shing, senior copywriters Paul Yu, Cyrus Ho and Kiu Chan, senior art director Katie Ng, art directors Mike Wong and Timothy Li, designer/illustrator Chen Jie Rong.